Please forgive any lack of clarity, a I am posting this at 1:45am. I was asked to implement caching on a project today. At my work, it has historically been our lead architect who has implemented caching across projects, so I was happy to get a new task. After the 3rd time I copied/pasted/modified this, I wanted to pull it out and leave less room for careless copy/paste mistakes. That still worked for parametherless Funcs but not for Metods with params. BIG Thanks to Hugo Dahl & Peter Ritchie, who helped me implement these using a single method (with and/or without params, no longer matters) using Lambdas. Solving a problem as common as caching by hand always feels wrong. In Java I’d use Guava’s CacheBuilder – it’s perfect for exactly this problem, when you have a function that knows how to retrieve the value if it is not in the cache already. It was great meeting you at Codemash, Jess! Thank you for your help with this today on Twitter. Everyone’s feedback was very appreciated! 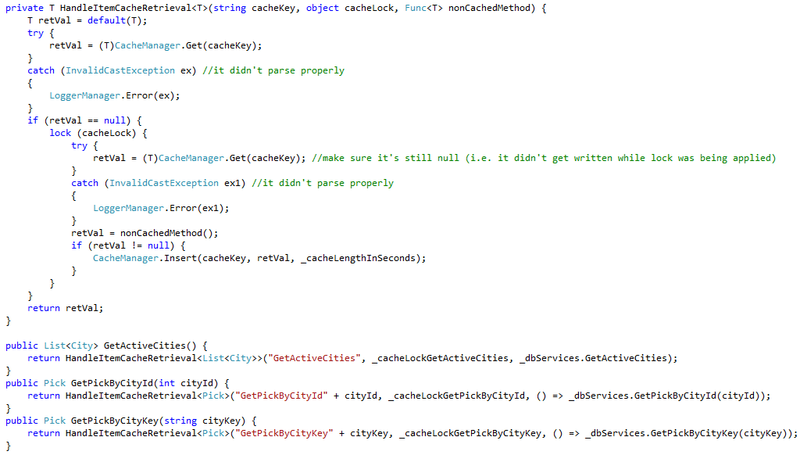 If you refactor the CacheManager, that I’m assuming uses a Dictionary behind the scenes, to use C# 4’s ConcurrentDictionary, you will be able to simplify your code removing all the locking and checking code. Works like a charm! I am about to experiment with some additional suggestions / recommendations & will post as I make more modifications. Does the ConcurrentDictionary implement protection from concurrent write scenarios as well as concurrent reads? Cori, it does, through the GetOrAdd method. GetOrAdd has an overload GetOrAdd(TKey key, Func valueFactory) that allows you to pass in a func that makes the db call and returns the value. Doing exaclty what you described. Checks for Key, if not found executes the func to get the value and add it to the Dictionary. All that done in a Thread safe mode, thus no need for manually locking. Ok THAT is very cool. I was unaware of that. My only problem then, in this particular implementation, might be that I have to go through a predefined caching provider (whose base class does not define an abstract GetOrAdd method) rather than doing the cache implementation directly. Hrm… I coudl probably write an extension method to translate the GetorAdd functionality… should I try to create a ConcurrentDictionaryCacheProvider? BIG Thanks to Hugo Dahl & Peter Ritchie, who helped me implement these using a single method (with and without params) using Lambdas. I’ve updated my the end of my original post with that implementation.